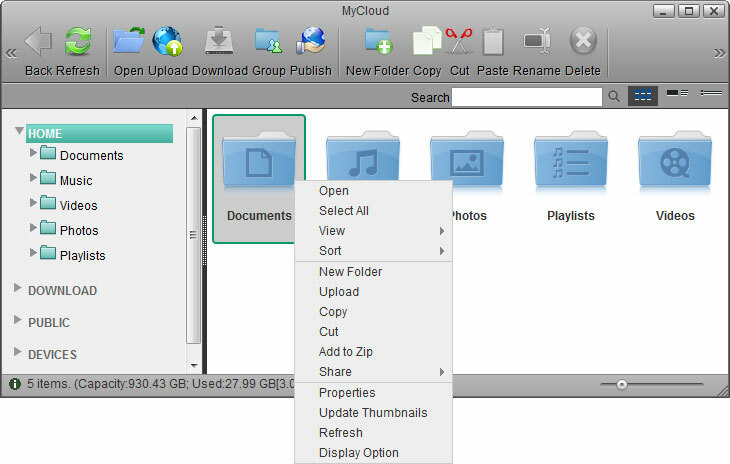 The MyCloud file explorer can be used to manage and view the files that are stored on the network drive through the web interface. As with the file explorer on the computer, you can right-click on a file to access the context menu, you can drag and drop files to move them, you can double-click on a file to open it and you can control (Ctrl) click or shift (Shift) click to select multiple files. Back Go back to previous folder. Open Open the selected file or folder (you can also double-click a file or folder to open it). If it's a folder, it will open it and display the content of that folder. If it's an image, it will open it in the image viewer. If it's a media file, it will open it in the media player. If the file format is unsupported by the built-in applications, it will prompt you to download the file to your computer instead. Upload Upload files from your computer and store them on the network drive. If this is the first time, select one of the supported upload methods. Option 1 is for older browsers that do not support HTML5 yet. You can only upload one file at the time. Option 2 is only for browser that already have Google Gears installed. Google Gears is no longer available for download. Option 3 is the recommended method for new browsers, letting you drag and drop multiple files onto the upload window. Download Download the selected file to your computer. To download more than one file at the same time, add the files to a Zip archive first. Group Share the selected folder with other users on your network drive. This function is only supported in the web interface, not when the drive is mounted via SMB or the files are access through FTP. Publish Create a public link to share the selected file or folder with your friends. New Folder Create a new folder in the current directory. Copy Copy the selected file(s) or folder(s). Cut Move the selected file(s) or folder(s). Paste Paste the files you have previously copied or cut into the current folder. Rename Rename the selected file or folder. Delete Delete the selected file(s) or folder(s) and move them to the recycle bin. If you hold down the shift (Shift) key when you click Delete, the file(s) or folder(s) are deleted permanently and are not moved to the recycle bin first. Search Enter a search term (partial or complete file name) and click the Enter key on your keyboard to show all files in the current folder that contain that search term. To reset the search and display all files again, erase the search term and click Enter or click on the magnifying glass beside the search field. View as Thumbnail Shows content as thumbnails. View as Details Shows content as thumbnails with additional details. View as List Shows content in list view without thumbnails. Click and hold the title bar to drag and move the window. Shows the available directories and folders. HOME Contains all the private files for the currently logged in user. This directory also includes all the default folders (e.g. Documents, Music, Videos, Photos). DOWNLOAD Contains the files that were downloaded with the help of the downloader application. PUBLIC Contains all the public files that are shared among the different users. DEVICES Lists all the currently mounted disks and displays their content. If an external USB drive is attached to the network drive, these files can also be accessed here. Each user gets its own HOME directory for private files and has access to the PUBLIC directory to share files among the different users. Only the administrator is able to view and access the DOWNLOAD and DEVICES directories. Shows the content of the currently selected directory. By default, this opens in the HOME directory displaying the Documents, Music, Videos and Photos folders. The thumbnails for new files are created either when you first access the folder or when the system starts up (e.g. after a reboot). If you leave the system running for a long time, it also checks every 24 hours to see if there are any new files that still need to be processed. If you have only just uploaded the files and immediately access the folder in the web interface, all file icons will be white. Wait for a few minutes and then click Refresh to see the thumbnails. Depending on the amount of files, creating thumbnails may take a while. N/A This file has either not been processed yet or is not among the supported file types for thumbnails. N/A The system has failed to create a thumbnail for this file. This could be because the format is not compatible with the thumbnail script or the file is too large and complicated for the system to process. Shows further details about the current folder. Shows more information about the current folder (e.g. amount of files and storage capacity). Move the slider to adjust the size of the thumbnails. Drag this handle to re-size the window. Right-click on a file or folder to open the context menu. Depending on the file type or folder you have selected, following commands are made available. Open Open the selected file or folder. Select All Select all files in the current folder. View Select how the files are displayed. 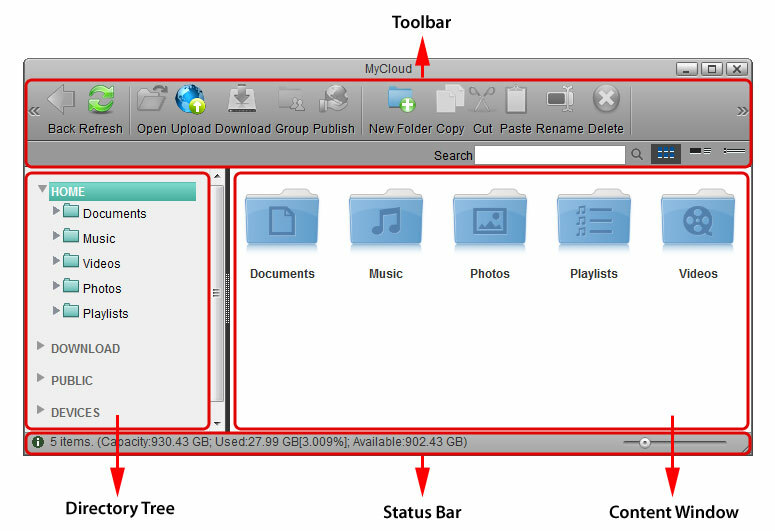 View as Thumbnail: Displays the contents with large icons and the file name below. View as Details: Displays the contents as a list along with large icons and detailed information. View as List: Displays the contents as a table along with small icons and detailed information. Sort Select how to sort the files. Name: Arranges the items according to their names. Size: Arranges the items according to their size. Type: Arranges the items according to their types. Last status change date: Arranges the items according to the date when the item's status was last changed. Last modified date: Arranges the items according to the date when the item was last modified. Upload Upload files from your computer and store them on the network drive. Download Download the selected file to your computer. Batch Rename Rename the selected files. Enter a new name and it will automatically number the files. Delete Delete the selected file(s) or folder(s) and move them to the recycle bin. Add to Zip Add the selected file(s) to a Zip archive. This stores the Zip archive in the HOME directory and creates a download link to immediately download the file. Image Rotate the selected image clockwise, counter-clockwise or set it as your new wallpaper. Share Share and publish the select file(s) with your friends and family. Email: Generate URLs for folders/files and email them to friends. SMS: Generate URLs for folders/files and send a SMS messsage with the URLs to friends (Taiwan only). Group: Share a folder with other users. Publish: Generate a URL for a folder/file and share it with your friends. Properties Show the properties of the selected file or folder. Update Thumbnails Re-generate the thumbnails in the current folder. Display Option Define the size for the icons, the grid and the text. Icon Size: Change the size of the icons. Grid Size: Change the grid size. Text Size: Change the size of the text beneath the icons. Apply to all: Enable this option to apply the changes to all folders including Applications and the Recylce Bin. Otherwise, the changes are only applied to the current folder.